Wanderlust is something we can all relate to. At some point or another, we've all just felt the innate urge to get up and go somewhere exciting and new! And then there are some of us who constantly feel antsy if we're not constantly on the go, or continuously exploring new places. My mom raised me in a certain way that encouraged wanderlust; she wanted me to explore and push myself to try new things in places I did not know. From an early age, I started getting sent off to summer camps and trying activities with people I'd never met (and in places I'd never seen before). As I got older, she encouraged me to join new extracurriculars and dip my toe in a variety of activities. When my junior year in high school rolled around, she did not even have to ask me where I wanted to go and visit--I had already mapped out all of the destinations around the U.S. I wanted to check out and see if their university was right for me; I ended up in the great state of Arizona, and earned my B.A. degree from Arizona State University (Go Devils!) While I was at ASU, I traveled like crazy! There were lots of opportunities to branch out, and I seized them whenever I could. I owe all of those amazing, unique travel experiences to my mom--the woman who taught me that having wanderlust is not only ok, but definitely healthy (and good for the soul!) It is because of her that I travel. 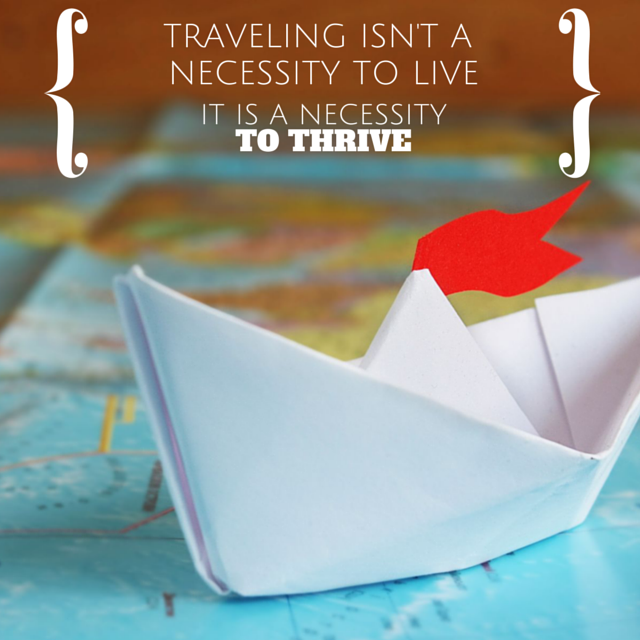 Traveling isn't a necessity to live--it is a necessity to THRIVE! I live in Arizona--a state that is filled with endless resorts and luxurious hotels. My husband and I take a staycation as often as we can--we travel somewhere new in our own state and have our own luxurious travel excursion with an affordable budget. Living a colorful and exciting life comes easily to people who regularly travel. And by travel, I don't necessarily mean people who have to whip out their passport at the airport. I'm talking about seeing new places and creating long-lasting memories. Majority of people cannot afford to travel all across the country, let alone to another side of the world! Traveling is possible for all incomes--so long as there is a little bit of planning and saving involved! Love this post! I love to travel, although most of the time when the opportunity for time off comes up, my family and I usually end up at Disney World :) My boyfriend really wants to visit Arizona, though, and I'm becoming more excited about that potential trip! Disney World sounds like a blast too though! !